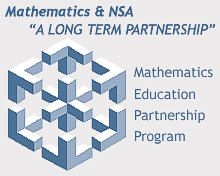 Acronym for Mathematics Education Partnership Program of the NSA & CSS. The Mathematics Education Partnership Program is a National Security Agency outreach program that promotes mathematics and science education at non-profit educational institutions. Working within the Associate Directorate of Education and Training, the MEPP staff coordinate hundreds of Agency volunteers. Continuing relationships are maintained between schools and volunteers who spend part of their work week providing tutoring, computer help, or math and science enrichment activities. The NSA & CSS continue to provide incentives for those in advanced education, including scholarships and internships.